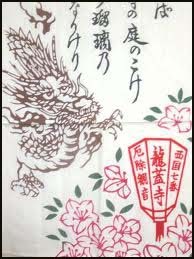 The Dragon in temple names refers to the Chinese dragon bringing clouds. It also refers to local legends about snakes and dragons in a pond. Another source is the posthumous Buddhist name of the temple founder, which often contains "Dragon". There are usually more than one temple with the same Dragon name.
. Bonten　梵天 Baramonten, Brahma .
. Ryuugeji 竜花寺 Ryuge-Ji "Dragon Flower Temple" . 竜海寺　Ryukai-Ji, 竜心寺 Ryushin-Ji, 竜天寺 Ryuten-Ji and 竜王寺 RyuO-Ji. Ryuufkukuji 龍福寺　Ryufuku-Ji "Dragon Luck Temple"
Ryuuganji 龍岩寺 Ryugan-Ji "Dragon Rock Temple"
. Ryuugeji 龍華寺 Ryuge-Ji "Dragon Lotus Temple" . Ryuujooji 滝上寺 Ryujo-Ji "Dragon Above Temple"
Ryuujooji 龍城寺 Ryujo-Ji "Dragon Castle Temple"
Ryuujuuji 竜樹寺　Ryuju-Ji "Dragon Tree Temple"
Ryuukooji 龍湖寺 Ryuko-Ji "Dragon Lake Temple"
... Ryuusuiji 龍水寺 Ryusui-Ji "Dragon Water Temple"
Ryuukooji　龍興寺 Ryuko-Ji "Dragon Prospering Temple"
Ryuumonji 竜門寺 Ryumon-Ji "Dragon Gate Temple"
Ryuutaku-ji 龍沢寺 Ryutaku-ji"Dragon Swamp Temple"
Ryuutenji 龍天寺 Ryuten-Ji "Dragon Heaven Temple"
Ryuutooji 龍頭寺 Ryuto-Ji "Dragon Head Temple"
Ryuuunji, Ryoounji 龍雲寺 Ryuun-Ji, Ryoun-Ji "Dragon Cloud Temple"
Ryuuzooji龍蔵寺 Ryuzo-Ji "Dragon Store Temple"
with a special ritual on June 1 (or the first sunday in June) to pray for safe rain and a good harvest. Prayers are made to this deity in times of drought or too much rain. 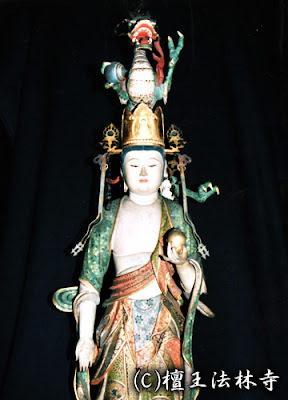 The statue is gentle like a Kannon statue, with a fearful dragon with long arms on her head. It was made in 1666 by order of Emperor Reigen Tenno 霊元天皇, after the river Kamogawa caused a great flooding. The Deity represents one of the Eight Great Dragon Kings 八大龍王 in its Buddhist version. Later Buddhist versions of the Dragon King Deities became more popular.
. Honryuuji 本竜寺 Honryu-Ji“Original Dragon Temple” .
. Hooryuuji 宝竜寺 Horyu-Ji “Precious Dragon Temple” . - - - - - 法龍寺 Horyu-Ji "Law Dragon Temple"
. Jyooryuuji 浄竜寺 Joryu-Ji “Pure Dragon Temple” . "Sea Dragon King Temple" .
. Keiryuuji 慶龍寺 Keiryu-Ji“Celebratory Dragon Temple” .
. Kinryuuji 金龍寺 Kinryu-ji - Golden Dragon Temple . The Golden Dragon (kinryuu son 金龍尊) is often mentioned in the Suvarna- prabhasa-sutra "Golden Light Sutra" (Goldglanz Sutra). Kooryuuji 高竜寺 Koryu-Ji“Tall Dragon Temple" .
. Manryuuji 万竜寺 Manryu-Ji “Myriad Dragons Temple” .
. Ooryuuji 黄竜寺 Oryu-Ji“Yellow Dragon Temple” .
. Ryuudooji 龍洞寺 Ryudo-Ji "Dragon Cave Temple" . Ryuugaiji 龍蓋寺 Ryugai-Ji "Dragon Lid Temple"
better known as Okadera　岡寺 Hill Temple, in Akusa, Nara. It was founded by Priest Gien (義淵) during the 7th century, and is the 7th temple on the Kansai Kannon Pilgrimage. The statue of Gien is one of the national treasures of Japan. During the time of Emperor Tenchi 天智天皇　Gien made an exorcism of a local vicious dragon, banned him in the pond and put a lid on it to keep it safe there. Is this temple the inspiration behind Dragon Ball Z? Visit Okadera Temple and the monks will likely say to you, “This is the Dragon Ball Z Temple. It is here where wishes can be granted.” Come back at them with a quip about the anime and the 7 dragon balls (they’re waiting for it) and laughs are bound to follow as is the story of Okadera. According to temple legend a Buddhist monk named Gaien confronted a dragon that was marauding what is now Asuka Village. Gaien defeated the dragon and imprisoned it under the floor of a small pond. He placed a large rock, a “ryugai” or dragon lid, in the pond to prevent the dragon from escaping. Thusly Ryugaiji Temple, Okadera’s formal name, was founded in 663. Supposedly, the dragon’s heart was “reformed” by its fight with Gaien and it became one of the temple’s deities. Japanese dragons have a ball near the end of their tail that contains magic. It is said that by the power of this dragon ball wishes can be granted. Dragon balls, Okadera’s most powerful variety of amulet, can be purchased (￥600ea.) but they are not of the 1 through 7 star variety. 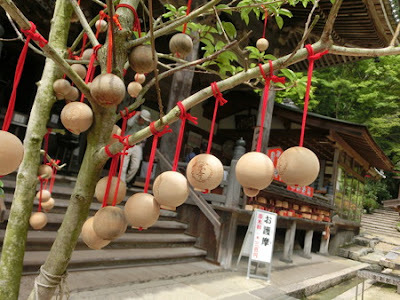 Known as “ryutama” 龍玉　(dragon balls) or negaitama (wishball), Okadera’s dragon balls are made of wood, inscribed with Okadera’s kanji characters, and contain a small paper scroll. Write your wish on the scroll and hang your dragon ball on one of the designated trees in the temple’s garden. Besides dragon ponds and dragon balls, Okadera is home to the Nyoirai Kannon Bosatsu wish granting seated Buddha statue, the oldest ceramic Buddha in Japan at 1200 years old, a 3-story pagoda overlooking the central Asuka Village area, several beautiful and historic buildings, and a garden of maple and deciduous trees that become riotously colorful in the fall.
. Ryuuginji 龍吟寺 Ryugin-Ji -Singing Dragon Temple .
. Ryuukooji　龍口寺 Ryuko-Ji - Dragon Mouth Temple . Tatsu no Kuchi 竜の口 the "Mouth of the Dragon"
. Ryuukooji 龍光寺 Ryuko-Ji - Temple of Dragon's Ray . Ryuutokuji 竜得寺　Ryutoku-Ji "Temple of Great Dragon Quality"
. Ryuuoo in 龍王院 Ryuo-In - Dragon God Hall .
. Ryuuooji 竜王寺 Ryuo-Ji "Dragon King Temple" .
. Ryuusenji 龍泉寺 Ryusen-Ji "Dragon Fountain Temple" .
. Seiryuujii, Shooryuuji 青竜寺 Seiryu-Ji .
. Senryuuji 泉竜寺 Senryu-Ji“Fountain Dragon Temple” .
. Tenryuuji 天龍寺 Tenryu-Ji "Heavenly Dragon Temple" . Unryuuji 雲龍寺 Unryu-Ji "Cloud Dragon Temple"
The dragon in the clouds is a metaphor for the enlightened mind, reaching out and above of the samsara world. is the cycle of birth, life, death, rebirth or reincarnation within Hinduism, Buddhism, Bön, Jainism, Sikhism, and other Indian religions.
. Zenryuuji 善竜寺 Zenryu-Ji “Good Dragon Temple” .
. Zenryuuji 全竜寺 Zenryu-Ji “Whole Dragon Temple” .
. Henro Pilgrim Temples in Shikoku .
. Wakasa Bay 若狭湾 . There are more Ryukei-In in Japan.
. Asakusa Kannon　浅草観音 . When the temple bell rang in the morning, the lovers from the Asakusa pleasure quarters of nearby Yoshiwara had to part and the men had to go home. 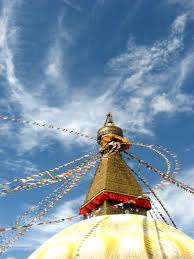 is traditionally associated with Buddhist temples. Myths about dragons living in ponds and lakes near temples are widespread. De Visser (1913:181-184) lists accounts for Shitennō-ji in Osaka, Gogen Temple in Hakone, Kanagawa, and the shrine on Mount Haku where the Genpei Jōsuiki records that a Zen priest saw a 9-headed dragon transform into the goddess Kannon. In the present day, the Lake Saiko Dragon Shrine at Fujiyoshida, Yamanashi has an annual festival and fireworks show. 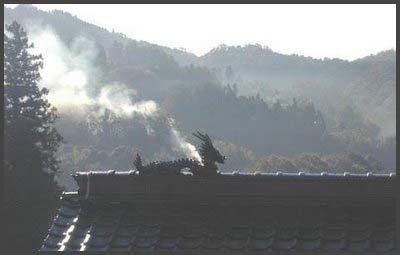 Temple names, like Japanese toponyms, frequently involve dragons. For instance, the Rinzai sect has Tenryū-ji 天龍寺 "Heavenly Dragon Temple", Ryūtaku-ji 龍沢寺 "Dragon Swamp Temple", Ryōan-ji 竜安寺 "Dragon Peace Temple". According to legend (de Visser 1913:180), when the Hōkō-ji 法興寺 or Asuka-dera 飛鳥寺 Buddhist temple was dedicated at Nara in 596, "a purple cloud descended from the sky and covered the pagoda as well as the Buddha hall; then the cloud became five-coloured and assumed the shape of a dragon or phoenix". The Kinryū-no-Mai "Golden Dragon Dance" is an annual Japanese dragon dance performed at Sensō-ji, a Buddhist temple in Asakusa. The dragon dancers twist and turn within the temple grounds and outside on the streets. According to legend, the Sensō Temple was founded in 628 after two fishermen found a gold statuette of Kannon in the Sumida River, at which time golden dragons purportedly ascended into heaven. The Golden Dragon Dance celebrates the temple founding and allegedly provides good fortune and prosperity.
. Ryuu Jinja 龍神社 Ryu Jinja "Dragon Shrines"
There are many more temples in Japan which are related to the Dragon, but do not carry its character in the name.
. Myooken Bosatsu 妙見菩薩 Myoken . Saitatsuji 西辰寺 "West Zodiac Dragon Temple"
. Omamori 龍神札 Dragon God Amulets .